The town of Springfield, Missouri recently settled with a Florida man for $200,000 after he suffered a knee injury from slipping and falling on one of the town’s decorated storm drains. The man’s knee injury is a common one in slip-and-fall accidents, and in this issue, we’ll look at others. 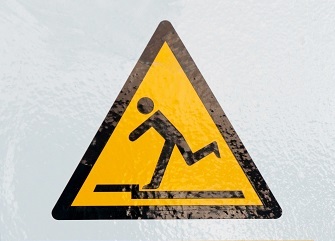 How common are slip-and-fall accidents? According to the National Safety Council (NSC), slip-and-fall accidents are responsible for more than 9 million visits to the emergency room annually. Worse than that, they are the #1 cause of unintentional deaths in the U.S.
What are common causes for slip-and-fall accidents? While it’s obviously true that you can experience a slip-and-fall accident because of your own negligence, the ones that wind up in litigation are the ones that occur on business property or on property owned by someone else. For example, some of the more common causes for slip-and-fall accidents include debris that’s been left on the floor; a floor that’s wet without any signage warning others of the danger; and surfaces that are uneven (much like what happened in the case mentioned above). What are common slip-and-fall injuries? What should I do if I’m in a slip-and-fall accident? We’ve talked before about steps to take if you’re involved in a slip-and-fall accident. Before leaving the scene of the incident, be sure that you’ve made supervisors of the property aware of the situation. Put it in writing. Injuries can take a while to make themselves known. That’s why it’s important to have a full medical examination by your doctor.